About one of every six people say they floss their teeth at least once a day, according to a recent survey conducted in partnership with the American Dental Association (ADA). But that doesn’t mean they’re using dental floss for the job. More than 60 percent of Americans say they sometimes use their fingernails to get food and gunk out of their teeth. And that’s not the only unsafe and unsanitary tool people admit to using. The list makes you wonder if the 8 percent of Americans who never floss with anything are better off! 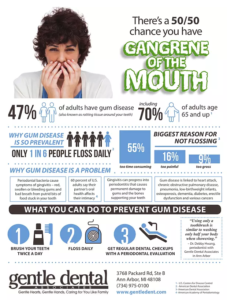 However, lack of flossing is a key contributor to gum and bone disease, or periodontitis, which affects nearly one of every two adults age 30 and up, according to the U.S. Centers for Disease Control. Not only is gum disease bad for your mouth, but it also is linked to other serious health problems like cancer and heart disease. Yet, many people with periodontitis don’t even know they have it. “Because the nerve endings in the gum and bone tissue around the teeth are not particularly sensitive, there normally is no pain when those sites present with infection. The problem is thus ignored,” said Dr. Debby Hwang, a periodontist with Gentle Dental Associates in Ann Arbor. Every adult should have a periodontal exam once a year, and it is even better when that exam is done by a gum specialist known as a periodontist. At Gentle Dental Associates, periodontist Debby Hwang examines each adult patient once a year at no additional cost. Bacteria naturally builds up in your mouth over the course of a day. If not removed, the bacteria cause plaque and, over time, tartar along and under your gum line. Eventually, that plaque and tartar can cause inflammation of your gums. That’s called gingivitis, an early stage of gum disease. Symptoms of gingivitis include bad breath, caused by bacteria and bits of decaying food stuck in your teeth, and gums that are red, swollen or bleeding. The good news is that gingivitis can be reversed with attention from a dentist or a periodontal specialist. But it also can progress into periodontitis, which is an advanced stage of gum disease when the damaged tissue pulls away from the teeth and creates gaps or pockets for even more bacteria. Those pockets can cause permanent damage to the bones in your jaw, loosening teeth and even causing them to fall out. In addition to causing jaw bone and tooth damage, people with gum disease have a higher risk of other serious diseases. The bacteria that cause periodontitis can travel through the bloodstream to other parts of the body, or the body may work so hard to fight periodontitis that other organs are exposed to threats. There’s evidence connecting periodontal inflammation to heart attack, stroke, pre-term/low-birthweight infants, chronic obstructive pulmonary disease, pneumonia, osteoporosis and cancers of the lung, skin, breast, kidney, pancreas and blood. Nearly half of Americans have some level of gum disease, and it afflicts more than two-thirds of adults age 65 and older. It’s so prevalent because people often are lax in their daily oral hygiene or they may neglect a regular semi-annual visit to the dentist. Many people just aren’t aware of periodontitis and how damaging it can be. But you should know that it is preventable. The best way to prevent gum and bone disease is by daily brushing and flossing, along with regular dental checkups. Brushing and flossing gets rid of bacteria before it can build up, and your dentist can remove plaque in hard to reach places that regular brushing and flossing miss. Still, the vast majority of people do not floss regularly. For example, surveys find that 20 percent of adults say they only floss when something is stuck in their teeth, and nearly half admit they lie to their dentist about how often they floss. For many people, daily flossing just takes too much time, hurts too much or is too gross. Unfortunately, the alternative could end up being much worse. In addition to daily brushing and flossing (with floss, not toothpicks or fingernails), every adult should have a periodontal exam once a year by a gum specialist known as a periodontist. Call to schedule your gum health evaluation. Just because you may have great-looking, healthy teeth does not necessarily mean that your gums and jaw bones are healthy, since the microorganisms that cause cavities are different than the bacteria that cause gingivitis and periodontitis. The result, of course, is that Chao developed many cavities as a middle schooler. A fear of doctors made her hesitant to visit the dentist, though she eventually did get fillings. But several years later, after moving to the United States, those fillings failed and her teeth began breaking apart. Still wary of the dentist, “it wasn’t until the pain stopped me from eating and smiling and caused me to avoid social interaction that I decided to do something,” she said. Chao went to Gentle Dental Associates in Ann Arbor for a consultation and was advised to get a dental implant. Skeptical at first, she did her own research on implants and other options for replacing missing teeth, then talked with other people who had gotten implants. She decided to go through with the procedure. Chao is like 170 million other adults in America who are missing teeth. Half of adults age 20-64 are missing at least one permanent tooth, according to the latest national survey data from the National Health and Nutrition Examination Survey. While a majority of people age 20-39 still have a full set of teeth, only one of every three people age 40-64 do. The primary causes of tooth loss include cavities and periodontal disease, which both stem from poor oral hygiene and lack of consistent dental care. A missing tooth can cause several problems. “If a tooth is missing, then chewing becomes less efficient and the neighboring teeth alongside the space may be subject to over-function and eventual fracture,” said Dr. Debby Hwang, a periodontist at Gentle Dental Associates. “An absent front tooth also may hinder cosmetics and speech. A removable denture is a cost-effective choice, but it needs to be taken out every night and is relatively fragile, so it might not provide full chewing function. Chao preferred to have a permanent replacement instead of something removable. A fixed bridge fuses a fake tooth to adjacent teeth and is not removable. The neighboring teeth get crowns that are fused to a fake tooth in the middle. Chao wanted to avoid cutting into her healthy, natural teeth to support a bridge. A dental implant involves a titanium anchor that’s placed into the bone where the tooth is missing. The jaw bone grows around the anchor, which is then capped with a crown several months later. It’s like having your own tooth back. An implant is typically a long-term solution that, unlike the other options, does not rely on neighboring teeth for support and cannot decay, Hwang said. Plus, many people are surprised by the lack of discomfort they experienced during and after the procedure. A dental implant is the most-costly option to replace a missing tooth, at least initially. But because it doesn’t decay or break it often can be the most cost-effective solution over the long term. If something breaks in a bridge, for example, you have to replace all three teeth. It’s also more likely to get cavities with a bridge because you can’t floss in between those teeth. Because a dental implant is fixed into the jaw, it can be a “high-value, high-return choice,” Hwang said. Chao was able to afford dental implants because her family had put aside money to pay for health care costs. If you have a Health Savings Account through your employer, that can be a great way to cover the cost. Many employers also allow people to put money into a flexible spending account (FSA) for health care, and that “use-it-or-lose-it” money has to be spent by the end of the year or it’s gone. If you have an FSA, that can be a good way to pay for implants before the end of 2018 — or a good place to put money in 2019 to pay for implants next year. The reward of being able to smile and laugh and eat with ease again has been well worth the cost to Chao. Dreading the dentist ranks right up there with being scared of snakes and afraid of heights as the biggest fears of Americans. 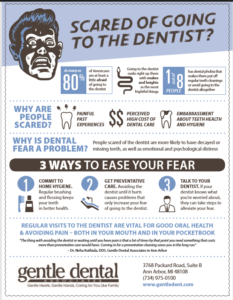 Now, a new study finds that fear of the dentist has a clear, negative impact of people’s oral health. One of every eight people has dental phobia, and they are more likely to have decayed or missing teeth, the study concludes. People scared of the dentist also tend to have more negative feelings like sadness, tiredness and lethargy, lead author Dr. Ellie Heidari said. While extreme dental anxiety is relatively rare, as many as 80 percent of Americans are at least a little afraid of going to the dentist. 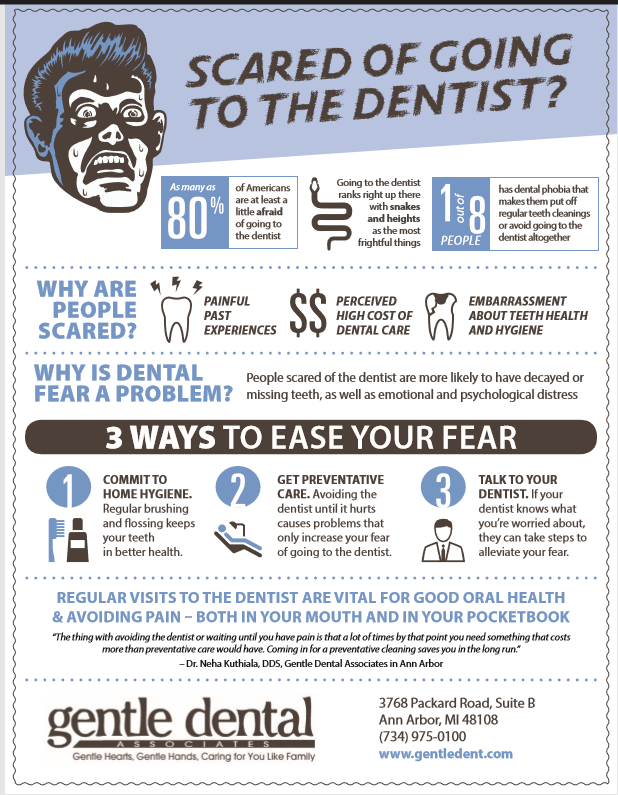 Unfortunately, that fear hinders people’s oral health because they put off regular teeth cleanings. Nearly a quarter of people who suffer from some level of dental anxiety do not get regular dental treatment, and upwards of 10 percent avoid going to the dentist entirely. That’s a problem because “regular dental attendance is central for maintenance of oral health as well as avoiding dental pain,” Heidari said. So what can be done about dental anxiety? First, let’s look at some of the causes. People worry about going to the dentist for any number of reasons: maybe they had a painful experience in the past, or maybe they’re scared by the sadistic, drill-happy dentist stereotype portrayed in movies. For some people the cost of dental care can give them pause, and for others it might be embarrassment about the health of their teeth. “Another one is fear of the unknown,” said Dr. Neha Kuthiala, DDS, a dentist at Gentle Dental Associates, an Ann Arbor practice that offers free consultations. “It’s a situation where you’re asked to sit with your mouth open and you can hear things and feel things but you have no idea what is being done to you. *Talk with your dentist about your anxiety — Share what you’re worried about. At the same time, a good dentist will take time to talk with anxious patients before looking into their mouths. “If we know the reason for anxiety, a lot of the time we can work with the patient to alleviate that,” Kuthiala said. The dentist can have a big impact on your level of anxiety simply by treating patients as people rather than procedures. That can include keeping patients up to speed on the progress of a procedure and talking about what they’re doing each step of the way, or giving patients control by allowing them to stop a procedure any time they feel uncomfortable. In addition, scheduling patients with the same hygienist and dentist every visit is a proven way to ease anxiety. Also, distractions like office music or a TV in the operating room can take people’s minds off their fear. Of course, providing nitrous oxide, or laughing gas, can be a good option for some anxious patients, too. “We’re all aware of how people don’t like to come to the dentist,” Kuthiala said. “We try our best to treat them with a gentle touch. Doing the paperwork to get coverage took time. Too much time, in this case. On a Saturday night a few weeks ago, the girl kept waking up in horrible pain. McClain-Moutardier wasn’t going to wait any longer. She took her daughter to the Emergency Room for pain relief, and then to a follow-up appointment with a dentist. She found out the routine dental care the girl needed had progressed into a serious problem requiring major repairs. Many people are scared of going to the dentist. Others may have a hard time fitting an appointment into their schedule, and in some places it’s not easy to find a dentist’s office. 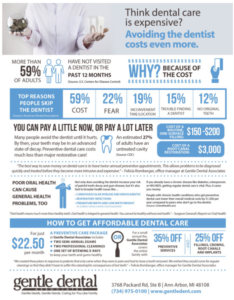 But, by far, the biggest obstacle to getting regular dental care is cost. Most people believe that visiting the dentist is important. Yet, nearly 60 percent of people who skipped routine dental care in the past 12 months said they couldn’t afford it, according to an American Dental Association poll. So, what’s the problem with avoiding the dentist? 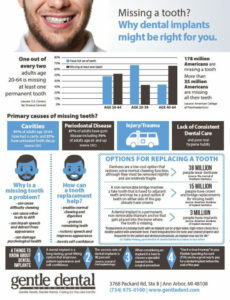 Well, just like an untreated problem with an automobile, problems with teeth get worse over time. In the long run, semi-annual dental cleanings cost much, much less than tooth extractions, crowns and root canals that can cost thousands of dollars. And it’s not just teeth that suffer when dental care is ignored. A growing body of research links poor oral health to several health problems including cardiovascular disease, respiratory infections and dementia. Studies have shown that people who see the dentist regularly have fewer health issues and spend less money on medical care overall. The survey data is helpful for public policy makers looking to improve the country’s health. On an individual level, the data makes it clear that private dental practices must do more to make routine care affordable to patients. Some dentist’s offices now offer discount plans to help patients pay for regular cleanings and avoid the much-higher costs of major restorative care. For example, Gentle Dental Associates in Ann Arbor offers a preventive care package that includes two semi-annual exams, two professional cleanings and one set of bitewing X-rays for the low cost of just $22.50 per month. Or, for a small annual fee, Gentle Dental Associates covers the entire family with 35-percent off preventive services such as exams, cleanings and X-rays, and 25-percent off restorative services such as fillings, crowns, root canals and implants. “We created these plans in response to patients that only came when they were in pain and had to have a tooth removed,” said Felicia Romberger, office manager. “We wished they would come for regular cleanings so that they didn’t have to suffer the catastrophic consequences of lost teeth. Even the cost of extracting the tooth would be about $100 more than filling the cavity early, and removing a tooth can lead to other problems: difficulty chewing, increased risk of bone loss and higher likelihood of additional extractions. About 60 percent of adults go to the dentist regularly, according to survey data. But many people put off visiting the dentist until something is wrong, and that’s when care becomes more expensive. The U.S. Centers for Disease Control estimates that 27 percent of adults have an untreated cavity. This can be fixed with a simple filling, but if the cavity festers and expands it will require dental care that can cost 15 to 20 times as much money. “All of this could be prevented if it was caught early, and a filling costs less than an extraction, too,” Romberger said. “Plus, there is little to no pain involved with a filling. 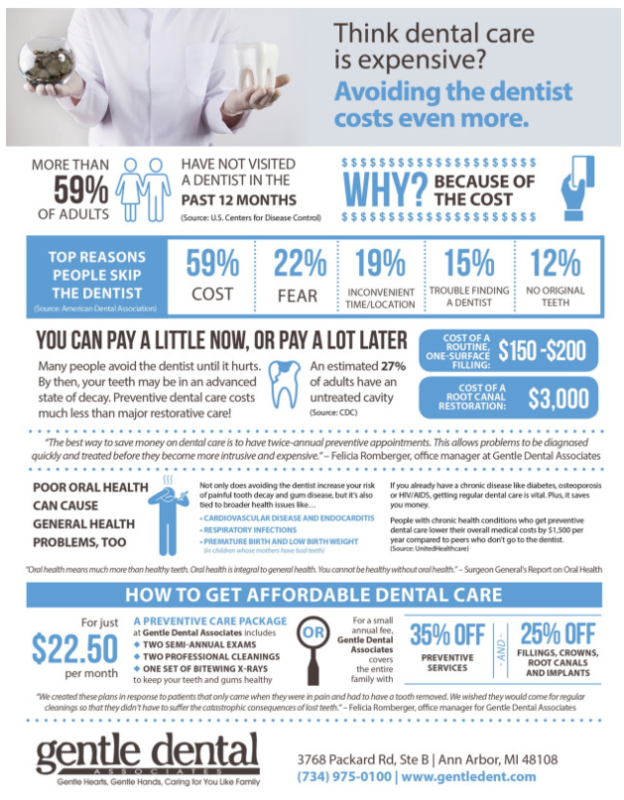 Ironically, putting off visits to the dentist because of cost actually ends up costing more in the long run. It was an expensive lesson learned for McClain-Moutardier. Her daughter had to have a pulpotomy on one of her molar teeth, and she’ll eventually need a full root canal, too. Worse than that, she feels horrible that her daughter had to go through such a painful experience. Behind cost, fear of the dentist was the second-biggest reason people avoid going to the dentist, according to the ADA survey. Other leading reasons: people say their appointment time and location are inconvenient, have trouble finding a dentist, or no longer have any teeth. Today we thought we would remind our patients to practice good oral hygiene to keep those pearly whites shining and happy! This includes brushing and flossing on a regular basis, brushing after consuming foods that can stain your teeth and visiting our office every six months or as recommended. • Brush your teeth twice a day with an ADA-accepted fluoride toothpaste. Replace your toothbrush every three or four months, or sooner if the bristles are frayed. A worn toothbrush won't do a good job of cleaning your teeth. • Clean between teeth daily with floss or an interdental cleaner. Tooth decay-causing bacteria still linger between teeth where your toothbrush bristles can’t reach. This helps remove plaque and food particles from between the teeth and under the gum line. • Visit our office on a regular basis for professional cleanings and oral exams. Lastly, a great reason to smile is this: smiling can actually help you live longer according to recent studies! Have you visited our office lately for a cleaning or checkup? If not, give us a call to set up an appointment! The beginning of the year is a great time for a visit! We know dental emergencies are never convenient nor timely. If you are a patient of record, we are committed to your dental health and are happy to see you. When your dental health is at risk, we will do everything we can to make sure that you’re treated as soon as possible. While dental emergencies are certainly rare, we know they can happen at any moment, and it’s important to know how to deal with them. If you have a dental emergency after regular office hours, please give us a call. We hope you’re all having a great holiday season!